Weymouth /ˈweɪməθ/ is a seaside town in Dorset, England, situated on a sheltered bay at the mouth of the River Wey on the English Channel coast. The town is 11 kilometres (7 mi) south of Dorchester and 8 kilometres (5 mi) north of the Isle of Portland. The town's population is 52,323 (2011). Weymouth has a metropolitan population of 71,083 (2016). The town is the third largest settlement in Dorset after the unitary authorities of Bournemouth and Poole. Weymouth is a tourist resort, and its economy depends on its harbour and visitor attractions; the town is a gateway situated halfway along the Jurassic Coast, a World Heritage Site on the Dorset and east Devon coast, important for its geology and landforms. Weymouth Harbour has included cross-channel ferries, and is home to pleasure boats and private yachts, and nearby Portland Harbour is home to the Weymouth and Portland National Sailing Academy, where the sailing events of the 2012 Olympic Games and Paralympic Games were held. The A354 road bridge connects Weymouth to Portland, which together form the borough of Weymouth and Portland. The history of the borough stretches back to the 12th century; including involvement in the spread of the Black Death, the settlement of the Americas, the development of Georgian architecture, and a major departure point for the Normandy Landings. Weymouth originated as a settlement on a constricted site to the south and west of Weymouth Harbour, an outlying part of Wyke Regis. The town developed from the mid 12th century onwards, but was not noted until the 13th century. By 1252 it was established as a seaport and became a chartered borough. Melcombe Regis developed separately on the peninsula to the north of the harbour; it was mentioned as a licensed wool port in 1310. French raiders found the port so accessible that in 1433 the staple was transferred to Poole. Melcombe Regis is thought to be the first port at which the Black Death came into England in June 1348, possibly either aboard a spice ship or an army ship. In their early history Weymouth and Melcombe Regis were rivals for trade and industry, but the towns were united in an Act of Parliament in 1571 to form a double borough. 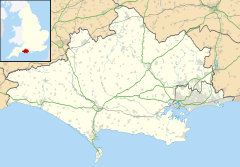 Both towns have become known as Weymouth, despite Melcombe Regis being the main centre. The villages of Upwey, Broadwey, Preston, Wyke Regis, Chickerell, Southill, Radipole and Littlemoor have become part of the built-up area. King Henry VIII had two Device Forts built to protect the south Dorset coast from invasion in the 1530s: Sandsfoot Castle in Wyke Regis and Portland Castle in Castletown. Parts of Sandsfoot have fallen into the sea due to coastal erosion. During the English Civil War, around 250 people were killed in the local Crabchurch Conspiracy in February 1645. In 1635, on board the ship Charity, around 100 emigrants from the town crossed the Atlantic Ocean and settled in Weymouth, Massachusetts. More townspeople emigrated to the Americas to bolster the population of Weymouth, Nova Scotia and Salem, Massachusetts; then called Naumking. There are memorials to this on the side of Weymouth Harbour and near to Weymouth Pavilion and Weymouth Sea Life Tower. The resort is among the first modern tourist destinations, after King George III's brother the Duke of Gloucester built a grand residence there, Gloucester Lodge, and passed the mild winter there in 1780; the King made Weymouth his summer holiday residence on fourteen occasions between 1789 and 1805, even venturing into the sea in a bathing machine. A painted statue of the King stands on the seafront, called the King's Statue, which was renovated in 2007/8 by stripping 20 layers of paintwork, replacing it with new paints and gold leaf, and replacing the iron framework with a stainless steel one. A mounted white horse representing the King is carved into the chalk hills of Osmington. Weymouth's esplanade is composed of Georgian terraces, which have been converted into apartments, shops, hotels and guest houses. The buildings were constructed in the Georgian and Regency periods between 1770 and 1855, designed by architects such as James Hamilton, and were commissioned by wealthy businessmen, including those that were involved in the growth of Bath. These terraces form a long, continuous arc of buildings which face Weymouth Bay along the esplanade. The earliest purpose-built hotel there was the first incarnation of the Royal Hotel. The esplanade features the multi-coloured Jubilee Clock, erected in 1887 to mark the 50th year of Queen Victoria's reign. Statues of Victoria, George III and Sir Henry Edwards, Member of Parliament for the borough from 1867 to 1885, and two war memorials stand along the Esplanade. In the centre of the town lies Weymouth Harbour; although it was the reason for the town's foundation, the harbour separates the two areas of Melcombe Regis (the main town centre) and Weymouth (the southern harbourside) from each other. Since the 18th century they have been linked by successive bridges over the narrowest part of the harbour. The present Town Bridge, built in 1930, is a lifting bascule bridge allowing boats to access the inner harbour. The Royal National Lifeboat Institution stationed a lifeboat at Weymouth for the first time on 26 January 1869. A boathouse was built with a slipway by the harbour and is still in use, although the lifeboat is now moored at a pontoon. During World War I, approximately 120,000 ANZAC personnel convalesced in Weymouth after being injured at Gallipoli or other theatres of the war. Weymouth and Portland were bombed by German planes in World War II; Portland harbour had a large naval base, and Weymouth was home to Nothe Fort, next to Nothe Gardens. Weymouth lost 76 civilian lives in the town through enemy action. The Bouncing bomb was tested in the Fleet lagoon to the west of town. 517,816 troops embarked through the borough to fight at the Battle of Normandy. The history of the area was documented at the Timewalk museum in Brewers Quay. The district of Weymouth and Portland was formed on 1 April 1974 under the Local Government Act 1972, and merged the borough of Weymouth and Melcombe Regis and the nearby Portland urban district. Following the local government reforms on 1 April 2019, the district was abolished, and Weymouth is now administered by Dorset Council at the highest tier, and Weymouth Town Council (successor to the district council) at the lowest tier. Weymouth, Portland and the Purbeck district are in the South Dorset parliamentary constituency, created in 1885. The constituency elects one Member of Parliament; currently Richard Drax (Conservative). For European Parliament elections, South Dorset, the rest of South West England, and Gibraltar form the South West England constituency. Dorset South was the most marginal Labour seat in the 2001 general election, won by 153 votes. Jim Knight was expecting to have a difficult 2005 election, yet he won with a margin of 1,812 votes—this was in contrast to other areas, where Labour suffered a decline in popularity. This was helped by a high-profile anti-Conservative campaign by musician Billy Bragg. The seat was gained from Labour by Drax for the Conservatives at the 2010 General Election. Weymouth and Portland have been twinned with the town of Holzwickede in North Rhine-Westphalia, Germany since 1986, and the French town of Louviers, in the department of Eure in Normandy, since 1959. 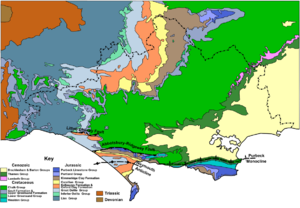 Geological map of Dorset. Weymouth lies on weak Middle Oolite clay. Weymouth is built on weak sand and clay rock which in most places along the Dorset coast, except for narrow bands at Lulworth Cove, Swanage and Durdle Door, has been eroded and transported away. This weak rock has been protected at Weymouth by Chesil Beach and the strong limestone Isle of Portland that lies offshore, 3 kilometres (2 mi) south of Wyke Regis. The island affects the tides of the area, producing a double low tide in Weymouth Bay and Portland Harbour. The maximum tidal range is small, at around 2 metres (7 ft). There are two lakes in the borough, both RSPB Nature Reserves—Radipole Lake in the town centre, and Lodmoor between the town centre and Preston. Radipole Lake, the largest nature reserve, and mouth of the River Wey before it flows into Weymouth Harbour, is an important habitat for fish and migratory birds, and over 200 species of plants. Radipole is an important tourist attraction; it and Weymouth Beach are situated very close to the main town centre. There are 11 Sites of Special Scientific Interest in the borough, which cover an area of 800.87 hectares (1,979 acres), and there are 37 other Nature Conservation Designations. Situated approximately halfway along the Jurassic Coast, Weymouth is a gateway town to the UNESCO World Heritage Site, which includes 155 kilometres (96 mi) of the Dorset and east Devon coast that is important for its geology and landforms. The South West Coast Path has two routes around Weymouth and Portland—one around its coast, and one along the South Dorset Downs, which reduces the path's length by 31.0 kilometres (19.3 mi). The path is the United Kingdom's longest national trail, at 1,014 kilometres (630 mi). Weymouth is the largest town in the area, larger than the county town of Dorchester, which lies just to the north, and hence is a centre of activity for the nearby population. A steep ridge of chalk called the South Dorset Downs, locally known as The Ridgeway, separates Dorchester and Weymouth; they are less agricultural than the valleys in the centre and north of Dorset, but have dairy and arable farms. The nearest villages to Weymouth are part of the built-up area, including Wyke Regis, Chickerell and Preston. The sand and clay on which Weymouth is built is very low-lying—large areas are below sea level, which allowed the eastern areas of the town to flood during extreme low pressure storms. In the 1980s and 1990s a sea wall was built around Weymouth Harbour and along the coast road in Preston; a rip rap groyne in Greenhill and beach nourishment up to Preston have created a wide and artificially graded pebble beach, to ensure that the low-lying land around Lodmoor does not flood. The defences at Preston, the extended ferry terminal and the widening of the Esplanade have changed the sediment regime in Weymouth Bay, narrowing the beach at Greenhill and widening the sands in Weymouth. A study conducted as part of the redevelopment of the Pavilion complex showed that the proposed marina will contribute slightly to this effect, but sand dredged out of the marina could be used to make the beach up to 40 metres (130 ft) wider. Climatic ergograph for Weymouth. Sea temperatures (light blue line) remain mild in winter and warm slowly in spring, helping to produce a seasonal lag of 1–2 months. Due to its location on the south-west coast of England, Weymouth has a temperate climate (Köppen climate classification Cfb), with a small variation in daily and annual temperatures. The average annual mean temperature from 1981 to 2010 was 11.2 °C (52.2 °F). The warmest month is August, which has an average temperature range of 14.1 to 20.1 °C (57.4 to 68.2 °F), and the coolest is February, which has a range of 3.7 to 8.4 °C (38.7 to 47.1 °F). Maximum and minimum temperatures throughout the year are above England's average, and Weymouth is in AHS Heat zone 1. [B] Mean sea surface temperatures range from 7.0 °C (44.6 °F) in February to 17.2 °C (63.0 °F) in August; the annual mean is 11.8 °C (53.2 °F). Weymouth and Portland has one of the sunniest climates in the United Kingdom, along with many south coast towns. The resort averaged 1869.8 hours of sunshine annually between 1981 and 2010, which is 43% of the maximum possible,[C] and 40% above the United Kingdom average of 1339.7 hours. December is the cloudiest month (62.9 hours of sunshine), November the wettest (88.7 millimetres (3.5 in) of rain) and July is the sunniest and driest month (243.6 hours of sunshine, 35.9 millimetres (1.4 in) of rain). Sunshine totals in all months are well above the United Kingdom average, and monthly rainfall totals throughout the year are less than the UK average, particularly in summer; this summer minimum of rainfall is not experienced away from the south coast of England. The average annual rainfall of 730.3 millimetres (28.8 in) is well below the UK average of 1,125 millimetres (44.3 in). The mid-year population of Weymouth in 2011 was 52,323,[A] in a built-up area of 18.5 square kilometres (4,600 acres), giving an approximate population density of 2,800 residents per square kilometre (11 per acre), in 25,174 dwellings. The population has grown steadily since the 1970s, mainly as a result of migration. There is an above average number of residents aged 60–84 (27.4%), however this is less than the Dorset average of 30.2%, and the proportion of the population between 18 and 59 is also above the Dorset average. The population is largely native to England—94.9% of residents are White British, slightly below the Dorset average of 95.5%, and well above the England and Wales average of 80.5%. The most common religious identity in Weymouth and Portland is Christianity, at 61.0%, which is slightly above the England and Wales average of 59.3%. The next-largest sector is those with no religion, at 29.3%, slightly above the average of 25.1%. House prices in Weymouth and Portland are relatively high by UK standards, yet around average for the south of England—the average price of a detached house in 2010 was £303,622; semi-detached and terraced houses were cheaper, at £204,647 and £203,207 respectively, and an apartment or maisonette cost £155,056. [G] The crime rate in Weymouth of 7.6 burglaries per 1000 households is lower than that of England and Wales (11.6 per 1000), but above that of Dorset (3.6 per 1000). Unemployment levels are low, particularly in summer, at 2.5% of the economically active population in July 2011, compared to the UK average of 7.7%. Weymouth Beach attracts thousands of visitors in summer. Tourism has been the largest industry in Weymouth for decades, though the number of people employed in the sector has declined slightly since its peak in the late 1990s. Weymouth's coast and beaches, lakes, museums, aquarium, and two shopping centres are the main attractions for visitors. The visitor accommodation consists of hotels on the seafront, guest houses around the town centre, and caravan and camping sites just out of town, including three sites owned by Haven and British Holidays: Littlesea, Seaview and Weymouth Bay. There are over two hundred events held throughout the year in the borough, including firework festivals, dragon boat racing, beach volleyball, handball and motocross, and the annual carnival in mid-August, which attracts around 70,000 people each year. Weymouth is the only port in the world to have hosted the start of The Tall Ships' Races three times—in 1983, 1987 and 1994; the 1994 race attracting 300,000 spectators. Nothe Fort is one of the maritime-related museums in the town. The Pavilion Theatre was built in 1960 on a peninsula of reclaimed land between the harbour and the esplanade, after the Ritz Theatre was destroyed by fire in 1954. The Pavilion was owned and operated by Weymouth and Portland Borough Council, providing a venue for local community groups and schools, and hosting seasonal 'end-of-the-pier' entertainment and year-round shows and events. It was announced in 2006 that the Pavilion complex and 4 hectares (10 acres) of its surroundings would be entirely redeveloped from 2008 to 2011, in time for the 2012 Summer Olympics. The proposed complex was to include a refurbished theatre, a World Heritage Site visitors' centre, a new ferry terminal, a 140-bed 4-star hotel, an underground car park, a shopping arcade, offices, around 340 luxury apartments, 110 affordable homes, public squares, promenades, and a 290-berth marina. Delays to the project mean it was unlikely to be completed in time for the 2012 Summer Olympics and the redevelopment never took place. In November 2012 Weymouth and Portland Borough Council announced the intended closure and demolition of the theatre, with the site closing on 31 May 2013. Following a formal tender process the theatre was leased to local businessman Phil Say and reopened on 13 July 2013. Weymouth Pavilion is now operated by Weymouth Pavilion CIC as a not-for-profit organisation. As part of the regeneration of Weymouth and Portland, it was decided in 2007 that Weymouth's esplanade will be redeveloped in time for the 2012 Olympic Games. Planned improvements include a public square around the restored statue of King George III, the restoration and extension the Art Deco pier bandstand, a Tourist information centre and café, Victorian-style shelters and seasonal kiosks, a beach rescue centre, and a sand art pavilion for the sculptures of Mark Anderson. Other alterations to the promenade were made, particularly around key areas such as the Jubilee Clock and the pier bandstand, with the introduction of new cafes and bars that connect the promenade and beach using innovative design, shaped like an upturned boat, also including a lighting scheme and seating areas with planting, fountains and trees. A 2010 council report said there are "venues with an emphasis on an alcohol-led night out. While these uses area positive attribute to the town, popular with both residents and visitors, they are also closely linked to a well-documented crime and disorder problem in the town centre." Weymouth's outer harbour hosts a large fishing fleet. 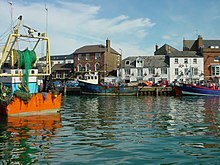 Weymouth Harbour is long and narrow, and formed the estuary of the River Wey until the building of a bridge to Westham, which separated the harbour's backwaters from Radipole Lake. For centuries the harbour was a passenger terminal and trade and cargo port: goods handled included wool and spices, and in the 20th century Weymouth was a bulk importer of fertiliser and cars. The old harbourside, on both sides of the seaward end of the harbour, still hosts a fishing fleet, with docks, unloading areas, and a cross-channel ferry terminal. Fishing and cargo trading employ fewer people in the area since their peak in earlier centuries, but local fishermen catch the largest mass of fish in England and the third largest in the United Kingdom. The inner harbour has been refurbished in two phases, in 1994–1996 and in 2002, to include a new marina with hundreds of berths for pleasure boats, cruisers and sailing boats. Local boats offer fishing and diving trips, pleasure cruises along the Jurassic Coast, and thrill-rides to the Isle of Portland. The main shopping centre in the area is in Melcombe Regis, consisting of two pedestrianised streets (St. Thomas's and St. Mary's Street), shops along the esplanade, and a new precinct stretching from St. Thomas's Street to the harbourside, built in the 1990s. There are shops and restaurants in the pedestrianised Hope Square and Brewers Quay, which are linked to the town centre by town bridge and a small passenger ferry service across the harbour. In 2005 the town centre had 292 shops and 37,500 square metres (404,000 sq ft) of floorspace, and there was 0.4 square kilometres (100 acres) of industrial estate in the area. The shopping catchment area, which extends for approximately 3 miles towards the north and seven miles east and west, has a population of 71,700 (mid-2001). Weymouth, Portland and Chickerell have been a Fairtrade Zone since 2007. Fashion company New Look has its global headquarters in Weymouth, and until 2005 the company's regional distribution centre was based at the same site. Plans were approved in 2007 to develop the New Look site to include new headquarters, retail warehouses and industrial units, a hotel, fire station, and a medical centre with ambulance station. In May 2013 local businesses voted in favour of creating the Weymouth Business Improvement District (BID). Like other BIDs located around the UK, it is a business-led initiative supported by Government legislation that enables the local businesses to raise funding to improve the trading environment. Weymouth railway station is the terminus of a route from London Waterloo and of a route from Westbury and Bristol. There used to be a station to handle summer tourist traffic, but this traffic declined and it was demolished in 1986. A smaller station took up part of the site, and the rest was given over to commercial development. Part of the South West Main Line from west of Moreton to east of Dorchester South has been reduced from dual to single track. Local councils lobbied the Department for Transport, in connection with the 2012 Olympic Games, to relay the double track and increase services. Services to London Waterloo began running every 30 minutes from December 2007, but services through Bristol to Cardiff were reduced. An unusual feature of the railways in Weymouth was that until 1987 main-line trains ran through the streets and along the Weymouth Harbour Tramway to the Quay station at the eastern end of the harbour, to connect with ferries to mainland Europe. Due to declining business, goods traffic ceased in 1972, but passenger services continued until they ceased in 1987 from lack of use. Weymouth was part of the CrossCountry network until Virgin CrossCountry withdrew its summer Saturdays only services from Birmingham and beyond in September 2001. They were briefly reinstated by Arriva CrossCountry during the 2012 Olympic Games. Local bus services are run by First Hampshire & Dorset, which bought the local Southern National company. Buses run from Weymouth to the Isle of Portland, Dorchester, Bournemouth, Wool, Beaminster, Axminster, and to other villages and the town's holiday parks. Weymouth is connected to towns and villages along the Jurassic Coast by route X53, which runs for 142 kilometres (88 mi) from Exeter to Poole, through Sidford, Beer, Seaton, Lyme Regis, Charmouth, Bridport, Abbotsbury, Weymouth, Wool, and Wareham. This service is convenient for walkers who can ride the bus to connect with the South West Coast Path for a walk along the coast. 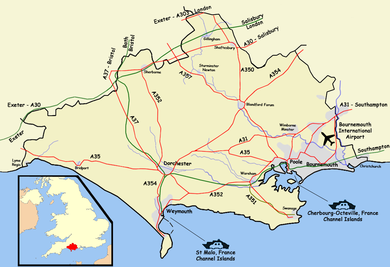 The A354 and A353 roads, Condor Ferries, and the South Western and Heart of Wessex lines link to Weymouth. The A354 road connects the town to the A35 trunk road in Dorchester, and terminates at Easton on the Isle of Portland. The A353 road runs east from Weymouth to the south of Warmwell, where it connects with the A352 to the Isle of Purbeck and Wareham. The B3157 road runs west from Weymouth to the south of Bridport where it terminates and connects to the A35. In the 1980s the town centre was bypassed by the A354 to Portland, but the government's road building policy changed before a proposed relief road could be completed. Before completion of the relief road, the A354 followed its original route through Upwey and Broadwey, where traffic problems were common at peak tourist times, particularly on event days such as the carnival. The relief road's construction was delayed by opposition from residents and environmental groups, including Transport 2000 and the Campaign to Protect Rural England, who objected to the route's partial destruction of a nature reserve, which is an AONB and SSSI. With Weymouth and Portland scheduled to host 2012 Olympic sailing events the project reopened; the local authorities favouring a more environmentally friendly proposal than in the 1990s. On 5 April 2007, Dorset County Council granted planning permission for a modified proposal including a single carriageway running 7 kilometres (4 mi) north, and a 1000-space park-and-ride scheme, costing £84.5 million. Work commenced in 2008; and was completed by mid-2011, in time for the 2012 Olympic sailing events. During archaeological excavations carried out in advance of the relief road construction, a burial pit containing 51 dismembered skeletons of Viking men was discovered on Ridgeway Hill. Locations in Wessex, from The Wessex of Thomas Hardy by Bertram Windle, 1902, based on correspondence with Hardy. Thomas Hardy lived and worked in Weymouth in 1869, and in 1871-2 lodging at 1 West Parade, now Park Street, returning to the Bockhampton cottage to complete Under the Greenwood Tree. Diggory Venn in Hardy's The Return of the Native describes the excitement of Weymouth, where "out of every ten folk you meet nine of ’em in love". Weymouth's Esplanade, the Gloucester Lodge Hotel and Old Rooms are featured in The Trumpet-Major (1880), renamed Budmouth in the 1895 edition, to bring the novel within fictional ‘Wessex’. Thomas Hardy walked on Chesil Beach many times, and it is featured in The Well-Beloved (1897). Joseph Drew wrote a historical novel The Poisoned Cup "a quaint tale of old Weymouth and Sandsfoot Castle" (1876), The Rival Queens, an account of the life of Mary Queen of Scots (1880), and several other popular works on religion, history and science. The novelist John Cowper Powys's novel Weymouth Sands (1934) is set in Weymouth, where he "was more at home than anywhere else in the world". Powys's paternal grandmother lived in Weymouth and the family lived in nearby Dorchester from 1880 to 1885. The novelist Gerald Basil Edwards spent the last years of his life in Weymouth. In nearby Upwey he met the art student Edward Chaney, who encouraged him to complete The Book of Ebenezer Le Page. Westcountry Television and Meridian Broadcasting are the local ITV television franchises. Westcountry is received from the Stockland Hill transmitter or from one of its three relay transmitters in the town (Wyke Regis, Bincombe Hill and Preston). Meridian is received from the Rowridge transmitter. The local newspaper is the Dorset Echo. Weymouth was used as location to film The Boat That Rocked, alongside nearby Portland Harbour, and Channel 4's Hugh's Fish Fight. Dunkirk, the 2017 war movie, was partially based in Weymouth. The Chesil Education Partnership pyramid area operates in south Dorset, and includes three infant schools, two junior schools, fourteen primary schools, four secondary schools and two special schools. 77.5% of Weymouth Town residents over 16 have qualifications, which is slightly below the Dorset average of 78.7%; about 20% of adult residents have higher qualifications (Level 4 +), which is lower than the Dorset average of 27%. There are three secondary schools in Weymouth—All Saints' Church of England School in Wyke Regis; Budmouth College in Chickerell; and Wey Valley School and Sports College in Broadwey. Wey Valley was added to the Government's Failing Schools list in 2007 as only 27% of the students achieved 5 A* to C passes. The fourth secondary school in the Chesil Education Partnership is Royal Manor Arts College on the Isle of Portland. All Saints' has 921 students on roll, Budmouth has 1560 and Wey Valley 1171. In 2006, 31% of students at Wey Valley, and 58% of students at All Saints' and Budmouth, attained five or more A* to C GCSEs including English and mathematics. Budmouth College also has a sixth form centre which had 296 students in 2006. Weymouth College in Melcombe Regis is a further education college which has around 7,500 students from South West England and overseas, about 1500 studying A-Level courses. The college offers a wide range of practical and academic courses in many subjects, ranging from apprenticeship courses to full and part-time university level courses. The college is part of The University of Plymouth Colleges Network. In 2006, Budmouth students received an average of 647.6 UCAS points, and Weymouth College students gained 614.1. Some secondary and A-Level students commute to Dorchester to attend The Thomas Hardye School; in 2007, 79% of Hardye school students received five or more A* to C GCSEs, and 78% of all A-Level results were A to C grades. The beach volleyball classic is held on Weymouth beach every July. Weymouth Cricket Club is sponsored by local business and runs in partnership with nearby schools. The local football club, Weymouth F.C. or 'the Terras', are outside the Football League but, in common with some other non-league clubs, they became professional in 2005. The team enjoyed erratic success at their level; twice playing in the third round of the FA Cup, the highest club competition level. At the end of the 2005–06 season the team became champions of the Conference South (the sixth level of English football) and moved up to the Conference National (the fifth level) for the first time since 1989. However the club were relegated at the end of the 2008–09 and 2009–10 seasons and now play in the Southern League Premier Division (the seventh level). The Terras' ground is the Bob Lucas Stadium; its record attendance is 6,500 against Nottingham Forest in the FA Cup 2005–2006 season. The Wessex Stadium is out of town, but until 1987 the team played at a ground near the town centre, which is now an Asda supermarket. The club's move pre-dated the move to new out-of-town grounds by professional league clubs, and was the first football stadium opened in England in 32 years. Motorcycle speedway racing was staged at the stadium from 1954 until the redevelopment; Weymouth's team was revived in 2003, and 'the Wildcats' race at a track adjacent to the stadium. However, the club closed early in 2011, following disputes with the landlords owning the stadium. In 2005 a scheme was proposed to rebuild the Wessex Stadium to occupy a pitch-and-putt golf course, coincidentally with Asda building on the previous stadium site. Although the plans were to move by August 2007, the scheme was shelved before construction could begin. On the shores of Portland Harbour, 3 kilometres (2 mi) south of Wyke Regis, is Weymouth and Portland National Sailing Academy, where the sailing events of the 2012 Olympic and Paralympic Games were based. The main reason that the resort was chosen to be a 2012 Olympic venue was because the National Sailing Academy had only recently been built, so no new venue would have to be built. However, as part of the South West of England Regional Development Agency's plans to redevelop Osprey Quay, in which the academy is built, a new 600-berth marina and an extension with more on-site facilities was built. Weymouth and Portland were one of the first locations in the United Kingdom to finish building a venue for the Olympic Games, as construction started in October 2007 and finished at the end of 2008. The waters of Weymouth and Portland were credited by the Royal Yachting Association as the best in Northern Europe for sailing. Local, national and international sailing events are regularly held in the bay; these include the J/24 World Championships in 2005, trials for the 2004 Athens Olympics, the ISAF World Championship 2006, the BUCS Fleet Racing Championships, and the RYA Youth National Championships. Tall ship Pelican, built as an Arctic fishing trawler in 1948, offers sail training voyages for youth. Weymouth Bay is a venue for other water-sports—the reliable wind is favourable for wind- and kite-surfing. The sheltered waters in Portland Harbour and near Weymouth are used for angling, diving to shipwrecks, snorkelling, canoeing, jet skiing, water skiing, and swimming. A Population figure is an estimate for mid-2011, and includes only the town of Weymouth – not Portland or surrounding villages. ^ a b c d e f g h i j k "Weymouth—Dorset For You". Dorset County Council. 2006. Archived from the original on 5 February 2012. Retrieved 14 December 2012. ^ "Weymouth (Agglomeration, Agglomerations, United Kingdom) - Population Statistics, Charts, Map and Location". www.citypopulation.de. Archived from the original on 10 November 2017. Retrieved 3 May 2018. ^ "Weymouth—Dorset For You". Dorset County Council. 2014. Archived from the original on 20 February 2012. Retrieved 23 January 2016. ^ "Town of Weymouth - Weymouth History". Weymouth Town Council. 2007. Archived from the original on 17 September 2010. Retrieved 3 July 2007. ^ "John Endicott and Captain Richard Clark". Weymouth & Portland Borough Council. 2007. Archived from the original on 6 October 2007. Retrieved 3 July 2007. ^ "Sir Christopher Wren". Weymouth & Portland Borough Council. 2005. Archived from the original on 6 October 2007. Retrieved 12 November 2006. ^ "Sir James Thornhill". Weymouth & Portland Borough Council. 2005. Archived from the original on 6 October 2007. Retrieved 12 November 2006. ^ (John Murray), A Handbook for Travellers in Wiltshire, Dorsetshire, and Somersetshire, 1859:116. ^ "King George III". Weymouth & Portland Borough Council. 2007. Archived from the original on 6 October 2007. Retrieved 3 July 2007. ^ "Understanding Weymouth's Georgian Architecture". wykeweb. 2006. Archived from the original on 18 July 2006. Retrieved 12 November 2006. ^ "Weymouth's Seaside Heritage". English Heritage. 2008. ISBN 978-1-84802-008-5. Archived from the original on 27 October 2017. Retrieved 26 October 2017. ^ "The Jubilee Clock on Weymouth Esplanade". Weymouth & Portland Borough Council. 2007. Archived from the original on 6 October 2007. Retrieved 3 July 2007. ^ "War Memorials". Weymouth & Portland Borough Council. 2007. Archived from the original on 6 October 2007. Retrieved 3 July 2007. ^ "Melcombe Regis historic buildings". Weymouth & Portland Borough Council. 2007. Archived from the original on 6 October 2007. Retrieved 3 July 2007. ^ "Station History". Weymouth Lifeboat Station. Archived from the original on 7 March 2010. Retrieved 19 November 2010. ^ "World War One: Weymouth invasion by injured Anzacs". BBC News. 3 June 2014. Archived from the original on 20 March 2015. Retrieved 20 March 2015. ^ "World War Two Timelines 1939–1945". worldwar-2.net. 2006. Archived from the original on 2 January 2007. Retrieved 12 November 2006. ^ "Weymouth and Melcombe Regis Municipal Borough, with list of casualties". Commonwealth War Graves Commission. Retrieved 22 February 2019. ^ "Brewers Quay". Brewers Quay. 2007. Archived from the original on 22 August 2007. Retrieved 12 August 2007. ^ a b "Knight 'inspires' swing to Labour". British Broadcasting Corporation. 6 May 2005. Archived from the original on 28 May 2006. Retrieved 13 December 2007. ^ Baston, Lewis (6 May 2005). "A print-out-and-keep guide to election night". London: Guardian Unlimited. Archived from the original on 18 September 2014. Retrieved 3 July 2007. ^ "Channel 4 -Election 2005". Channel 4. 2005. Archived from the original on 23 August 2006. Retrieved 12 November 2006. ^ "Geology of the Central South Coast of England". Southampton University. 2006. Archived from the original on 24 August 2007. Retrieved 14 August 2007. ^ "Portland Harbour". Bristol Nomads Windsurfing Club. 2007. Archived from the original on 29 September 2007. Retrieved 30 July 2007. ^ a b "Tides: Portland". British Broadcasting Corporation. 2007. Archived from the original on 11 March 2017. Retrieved 6 May 2016. ^ "Radipole Lake Visitors' Centre". Weymouth & Portland Borough Council. 2007. Archived from the original on 13 May 2007. Retrieved 3 July 2007. ^ "Distance Calculator". South West Coast Path Association. 2006. Archived from the original on 12 December 2007. Retrieved 13 December 2007. ^ "Park District, Weymouth, Flood". Weymouth & Portland Borough Council. 2007. Archived from the original on 24 October 2007. Retrieved 17 June 2007. ^ "Isle of Portland and Weymouth Bay". SCOPAC. 2004. Archived from the original on 5 May 2015. Retrieved 4 August 2007. ^ "Report boosts Pavilion site marina plan". Dorset Echo. 2007. Archived from the original on 26 September 2007. Retrieved 4 August 2007. ^ a b c d "Climate – Chosen location: Weymouth". Met Office. 2012. Retrieved 5 December 2012. ^ a b "Cefas Station 24: Weymouth". The Centre for Environment Fisheries & Aquaculture Science. 2006. Archived from the original on 13 June 2007. Retrieved 21 May 2007. ^ "Climate - Chosen location: Weymouth". Met Office. 2012. Retrieved 5 December 2012. ^ "Temperature and Frost". Geoff Kirby. 2005. Archived from the original on 1 December 2008. Retrieved 18 November 2006. ^ "Land & Marine Surface Stations Data 1853–Current". Met Office. 2012. Archived from the original on 4 January 2010. Retrieved 16 October 2012. ^ "Days of Snow Lying Annual Average". Met Office. 2001. Archived from the original on 9 August 2007. Retrieved 18 October 2006. ^ "Mean Temperature Winter Average". Met Office. 2001. Archived from the original on 31 May 2010. Retrieved 12 November 2006. ^ "Growing season length – Annual average: 1971–2000". Met Office. 2012. Archived from the original on 3 March 2016. Retrieved 5 December 2012. ^ "Hardiness Zone Map for Europe". GardenWeb. 1999. Archived from the original on 21 June 2007. Retrieved 20 June 2007. ^ a b "Southern England: climate". Met Office. 2009. Archived from the original on 5 June 2011. Retrieved 21 December 2009. ^ Penn, Robert; Woodward, Antony (18 November 2007). "Bring me sunshine". London: Times Online. Archived from the original on 12 May 2008. Retrieved 8 March 2008. ^ a b c d "2011 Census, Key Statistics for Local Authorities in England and Wales". Office for National Statistics. 2012. Archived from the original on 5 January 2016. Retrieved 14 December 2012. ^ "All releases of Labour Market Statistics". Office for National Statistics. 2011. Archived from the original on 18 May 2007. Retrieved 14 December 2012. ^ "Volume and value of tourism in Dorset, 1990–2003". Dorset County Council. 2005. Archived from the original on 27 August 2006. Retrieved 12 November 2006. ^ "35 great UK Holiday Parks to choose from". Haven and British Holidays. 2008. Archived from the original on 29 February 2008. Retrieved 7 March 2008. ^ a b c "Weymouth and Portland 2008 - A year of true adventure!". Weymouth & Portland Borough Council. 2008. Archived from the original on 14 March 2008. Retrieved 25 February 2008. ^ a b "Beach Volleyball Classic". Weymouth & Portland Borough Council. 2008. Archived from the original on 13 March 2008. Retrieved 25 February 2008. ^ a b "Weymouth 2008 International Handball Championships". Weymouth & Portland Borough Council. 2008. Archived from the original on 13 March 2008. Retrieved 25 February 2008. ^ a b "Weymouth Beach Motocross". Weymouth & Portland Borough Council. 2008. Archived from the original on 13 March 2008. Retrieved 25 February 2008. ^ a b c "Brief History of the Port of Weymouth". Weymouth & Portland Borough Council. 2006. Archived from the original on 3 May 2007. Retrieved 23 April 2007. ^ "2012 Transport Tenth Special Report". Parliament of the United Kingdom. 2006. Archived from the original on 23 November 2006. Retrieved 23 April 2007. ^ "Weymouth Pavilion 1908–1960". Pavilion Past history project. 2006. Archived from the original on 29 June 2007. Retrieved 25 July 2007. ^ "Pavilion plans go on display". Dorset Echo. 2008. Archived from the original on 19 July 2008. Retrieved 18 July 2008. ^ "Pavilion work will not be finished". Dorset Echo. 2008. Archived from the original on 19 March 2009. Retrieved 13 January 2009. ^ "Weymouth Pavilion History". www.weymouthpavilion.com. Archived from the original on 15 January 2015. Retrieved 9 January 2015. ^ a b "Weymouth Esplanade: a visionary masterplan" (PDF). Weymouth & Portland Borough Council. 2007. Archived (PDF) from the original on 9 August 2007. Retrieved 20 July 2007. ^ "New vision for our seafront". Dorset Echo. 2007. Archived from the original on 26 September 2007. Retrieved 20 July 2007. ^ "Jurassic Coast – Boat Trips". Jurassic Coast. 2006. Archived from the original on 27 September 2007. Retrieved 9 July 2007. ^ "Thumbs up at New Look site". Dorset Echo. 2007. Archived from the original on 26 September 2007. Retrieved 25 August 2007. ^ "Business Improvement Districts - Detailed guidance - GOV.UK". www.gov.uk. Archived from the original on 18 September 2016. Retrieved 3 August 2016. ^ "London 2012 Olympic Games Sailing Events". Dorset County Council. 2005. Archived from the original on 23 August 2006. Retrieved 22 August 2006. ^ "Rail timetable offers London at the double". Dorset Echo. 2007. Archived from the original on 7 December 2007. Retrieved 5 December 2007. ^ "Weymouth Harbour Tramway". Island Publishing. 2005. Archived from the original on 8 December 2007. Retrieved 12 August 2007. ^ "Dorset Timetables". First Group. 2007. Archived from the original on 11 August 2007. Retrieved 7 August 2007. ^ "Jurassic Coast Bus Service". Jurassic Coast. 2007. Archived from the original on 26 August 2007. Retrieved 7 August 2007. ^ a b "Weymouth Relief Road". Dorset County Council. 2005. Archived from the original on 17 June 2006. Retrieved 22 June 2006. ^ "Relief Road Protest Lodged". Dorset Echo. 2007. Archived from the original on 26 September 2007. Retrieved 10 July 2007. ^ a b "Green Light for Relief Road". Dorset Echo. 2007. Archived from the original on 26 September 2007. Retrieved 23 April 2007. ^ "Dismembered skeletons' Saxon link". BBC News. 10 July 2009. Retrieved 12 March 2010. ^ "Thomas Hardy and Dorset". Thewordtravels.com. 15 July 2015. Archived from the original on 19 March 2016. Retrieved 26 April 2016. ^ unpublished diary 1940, quoted by Morine Krissdottir,Descents of Memory: The Life of John Cowper Powys. (New York:Overlook Duckworth, 2007), p.29. ^ Edward Chaney (2015). Genius Friend: G.B. Edwards and The Book of Ebenezer le Page. Blue Ormer Publishing. Archived from the original on 18 October 2015. ^ "Extras rock the boat". Your Stories. BBC. 2009. Archived from the original on 24 September 2015. Retrieved 22 February 2014. ^ Hendy, Arron (2010). "Weymouth fish shop chef takes mackerel to Parliament". Dorset Echo. Archived from the original on 3 March 2014. Retrieved 22 February 2014. ^ "Weymouth Town Electoral Division Profile 2013" (PDF). Dorset County Council. p. 3. Archived (PDF) from the original on 4 April 2015. Retrieved 23 January 2016. ^ "Full list of failing schools". The Daily Telegraph. London. 11 June 2008. Archived from the original on 15 November 2010. Retrieved 6 April 2010. ^ a b "Secondary Schools (GCSE) in Weymouth". Dorset Echo. 2006. Archived from the original on 30 October 2007. Retrieved 4 January 2008. ^ a b c "Secondary Schools (A-Level) in Weymouth". Dorset Echo. 2006. Archived from the original on 30 October 2007. Retrieved 4 January 2008. ^ "University of Plymouth Partnership - Weymouth College". weymouth.ac.uk. Archived from the original on 1 December 2017. Retrieved 3 May 2018. ^ "Results – The Thomas Hardye School". The Thomas Hardye School. 2007. Archived from the original on 11 April 2008. Retrieved 4 January 2008. ^ "Weymouth Beach Kite Festival". Weymouth & Portland Borough Council. 2008. Archived from the original on 13 March 2008. Retrieved 25 February 2008. ^ "CRICKET: Seasiders secure lengthy sponsorship deal (From Dorset Echo)". Dorsetecho.co.uk. 31 July 2014. Archived from the original on 31 March 2016. Retrieved 26 April 2016. ^ a b "'Terras' Timeline". Weymouth F.C. 2007. Retrieved 13 August 2007. ^ "League Tables & Results". Weymouth F.C. 2007. Archived from the original on 15 August 2007. Retrieved 13 August 2007. ^ "Weymouth – Nottingham Forest". Football.co.uk. 2006. Archived from the original on 8 August 2007. Retrieved 3 July 2007. ^ a b "Club History". Weymouth Wildcats Ltd. 2007. Archived from the original on 17 August 2007. Retrieved 5 September 2007. ^ "Terras set move date". Dorset Echo. 2005. Archived from the original on 2 April 2015. Retrieved 3 September 2005. ^ a b "Sailing town's joy at Olympic win". British Broadcasting Corporation. 6 July 2005. Retrieved 7 January 2008. ^ "Dean and Reddyhoff Marina". Dean and Reddyhoff Limited. 2007. Archived from the original on 28 September 2007. Retrieved 26 March 2007. ^ "New Olympic marina plan approved". The British Broadcasting Corporation. 27 June 2007. Archived from the original on 19 August 2007. Retrieved 27 June 2007. ^ "Ship Specifications". Archived from the original on 28 December 2011. Retrieved 16 February 2012. ^ "Watersports in Weymouth & Portland". Weymouth & Portland Borough Council. 2006. Archived from the original on 10 October 2006. Retrieved 12 November 2006. ^ "Plant Heat Zone Map" (PDF). American Horticultural Society. 2005. Archived (PDF) from the original on 12 August 2012. Retrieved 3 January 2008. Wikimedia Commons has media related to Weymouth, Dorset. Wikivoyage has a travel guide for Weymouth.